On June 2, 2015, The Straddler met with Kazys Varnelis in Midtown Manhattan for a conversation about the history and future of suburbs and cities. Varnelis, an architectural historian, is the co-founder of AUDC, an experimental architecture collaborative. With Robert Sumrell, he is author of Blue Monday: Stories of Absurd Realities and Natural Philosophies (2007). He also edited The Infrastructural City: Networked Ecologies in Los Angeles (2009). In November of 2014, while Director of Columbia University's Network Architecture Lab, he contributed to the Museum of Modern Art's “Uneven Growth: Tactical Urbanisms for Expanding Megacities,” which ran until May of this year. The show focused on “increasingly inequitable urban development” and its consequences for a world in which two-thirds of a projected 2030 global population of eight billion will live in cities, where most will be poor. We previously spoke with Varnelis twice: once on network culture for our fall2011 issue, and once in dialogue with Trevor Paglen on surveillance for our winter2014 issue. Varnelis posts regularly on his site, varnelis.net. That bashing suburbs is increasingly common among both academics and politicians should raise eyebrows that something is up. It’s easy to see suburbs as parasitic, but we have to understand that historically the relationship between suburb and city is complex: complicated but always intertwined. In the nineteenth century, the cult of domesticity became popular, and with it the conviction that the city was a domain of male work whereas the suburb was a domain of female work—specifically, child rearing—and that both women and children were better off away from the corrupting influences of urbanity. Compounding this was the psychological theory of overstimulation, which held that the countryside was a palliative for frayed nerves caused by overwork. Early suburbs emerged to address both of these needs. 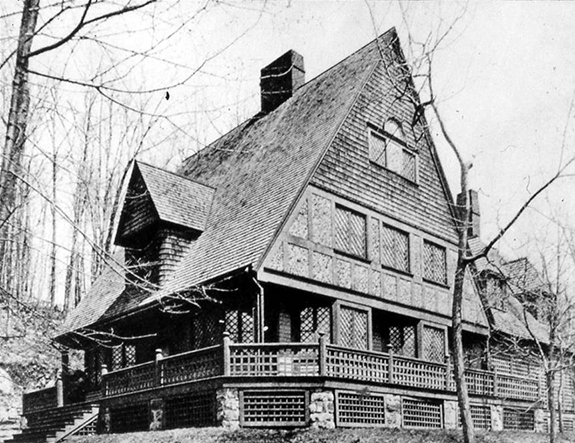 They were often full of vacation houses that the wealthy occupied in the summer or on weekends and, with the growth of commuter rail, there were also families that resided in them full time, with men coming back to outlying towns at night or, sometimes, just on weekends. That was the rise of the first generation of suburbs—places like Tuxedo Park, Montclair, Llewelyn Park, or parts of Nassau County near New York, or Ravenswood and Highland Park near Chicago, or Beverly Hills and Pasadena near Los Angeles. Over time, many of these suburbs got absorbed into their dominant city as it expanded. This was a natural process of urban growth that was seen by many as inevitable into the 1930s. Remember that it wasn’t too long since the Upper West Side and the Upper East Side—even though they had apartment buildings—were essentially suburban, commuter villages too. Even so, urban boosters really didn’t give the suburbs too much thought: business was the lifeblood of the city and it was fine for children and housewives to be out in the suburbs so long as business and its money stayed downtown. Beginning in the 1930s this began to change as secondary business districts emerged, taking on their own identities distinct from downtown. 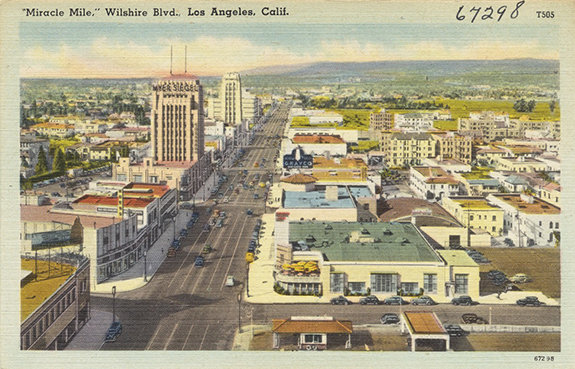 The Miracle Mile in Los Angeles is an example of this, and it was particularly revolutionary in terms of its role in the city. You now had an entire shopping district—built during the depths of the Great Depression—that was very successful because it was no longer in the city. Yes, it waswithin Los Angeles, so it had a certain relationship with the city in terms of taxes and so forth, but it was miles west of the city core, amidst more affluent suburban communities. And when developers began to specialize in developing secondary business districts outside of city cores, the traditional downtown boosterism started to fall apart. Now a doctor or a lawyer may not have to go all the way downtown—he might just want to go to his job in one of these secondary business districts. More importantly, housewives didn’t have to go into the overcrowded, aging city center and could have their packages carried to their car by a valet. Compounding this, between the Depression and World War II, you had twenty years where virtually nothing was built in city cores. By the end of World War II, you had people like Jean-Paul Sartre and Albert Camus remarking on how old New York City looked. My parents, who came to America from Lithuania said the same thing. These are all people who had lived through World War II in Europe—you would think they would talk about New York in glowing terms. No. They came through the city to visit, or in the case of my parents, to settle, and they all had the same reaction—it somehow seemed ancient. Twenty years of nothing. In some ways, this was worse than the 1970s. The seventies may have had a more precipitous decline, but you still had the Citicorp building, the Twin Towers, the AT&T building. You could certainly read the city’s progress, even if a decline was also in the works. But between the early 1930s and late 1940s, there was almost nothing built—Rockefeller Center and various works by Robert Moses being the major exceptions. White flight was unquestionably a component of the massive migration to the suburbs after World War II, but there is more to it than that. Cities were run down, outdated, and remained very crowded. 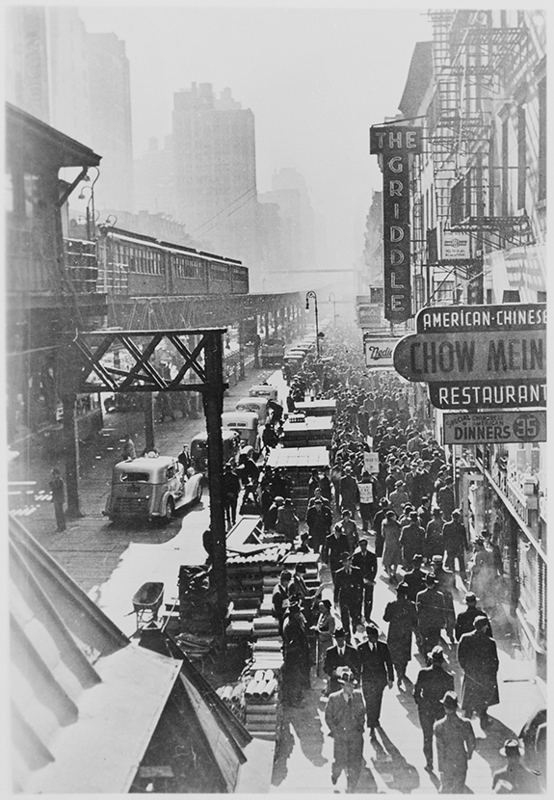 When you look at the tenements in the Lower East Side in the early twentieth century, their levels of population had been closer to what we now associate with China or India—eight people to a one-bedroom apartment, 1,100 people per block. By the mid 1940s, population levels had dropped, but you still had a lot of crowding in run down buildings, leading to overall conditions that were not that great. People were eager to get out. Moreover, by the 1950s, Sigmund Freud’s work had become dogma, particularly in child rearing. If you look at the first edition of Dr. Spock’s Baby and Child Care, it’s all Freud. The suburbs fulfilled a Freudian dictum that the proper place for raising children—particularly boys, but girls as well—is in a house in which the nuclear family is isolated. If you live with grandma and the rest of the extended family, a little boy might improperly resolve his Oedipal complex—he might be fixating on grandma or someone else—instead of his mother. And if his mother isn’t taking care of him, his care should be in the hands of a suitable replacement like a young babysitter from the neighborhood. Even when Freud didn’t directly inform everyone’s decision to move to the suburbs, it was something that pediatricians, social workers, and advice column writers would talk about, revisiting the nineteenth-century argument about a division between a sheltered domestic space and the city as a space of work again, and that had a lot to do with the shift towards the suburbs. And of course by the time you got into the late 1960s there was a great deal of concern about minorities and unrest. Racism reared its ugly head, often egged on by unscrupulous real estate agents and developers who made money off the property sales. That said, it’s important to note that it wasn’t just white flight that decimated the inner city. Black flight existed as well. If an African American family made it into the lower middle class, they’d get out just as soon as a white family. People would look for places to go where their children would get to go to good schools and where taxes would be lower. And this has a connection to today, because the most important urban trend of the last twenty years is not that cities have become hip and popular, but rather that as they have become hip and popular, there has been a reallocation of resources and capital to those hip urban areas and away from urban and suburban areas that are no longer perceived as viable. What is very dangerous about this is that many areas are now seen by urban boosters, as well as by mayors such as former Mayor Bloomberg, as places to dump the poor. In Bloomberg’s case, he removed the homeless to motels on the periphery of the city, or literally gave them tickets to leave the city outright. Take Manhattan today: it’s obviously a place that is incredibly wealthy. The vast majority of people are doing very well. But if you look at areas in the outer boroughs or even better at places like Newark, Paterson, Passaic, Hempstead, Newburgh, East Orange, or Poughkeepsie—these are places that have seen their fortunes turn dramatically in the wrong direction. Academics, pundits, and urban boosters generally ignore the existence of these slums, or when they acknowledge them, damn them as evidence of the failure of the suburban model even when many such places are actually quite urban. In lockstep with this, politicians find such places convenient dumping grounds for people who are consuming tax rolls: get them out of the city and send them somewhere else. Politically, these localities wind up being disenfranchised and wind up having a tough time getting the voice that they deserve. And lacking this voice, they will run into trouble. It’s a modern day version of Mike Davis’s City of Quartz, except with distance and political boundaries replacing fortification. Moreover, when we talk about urban revitalization, we’re really thinking about New York, San Francisco, Chicago, Boston, Los Angeles, and maybe Austin—we really aren’t looking at many more cities than that. Maybe Miami, but that has tremendously poor areas as well (although so does Chicago). But many cities are places that people are still leaving. Very few cities are winners, and there are plenty of losers. You can look at Utica; Pittsfield, Massachusetts; New Haven; Fresno; Lancaster; or Indio. Detroit, of course. And even if we call Chicago successful, we have to remember that it lost over 200,000 residents between 2000 and 2010. The decline in Chicago reminds us that since 2000, the biggest story in urban demographics has been a massive decline in black population in northern cities. 17% of African Americans left Chicago between 2000 and 2010. Some 450,000 African Americans have left New York State since 1975. As this has happened, places like Manhattan have become enclaves where academics, journalists and public intellectuals have come to see nothing else but their own world, and so endlessly validate it. These are people who go from global city core to global city core all the time, and don’t see anything else, don’t really get that there are a lot of problems beyond the boundary of the global city. The global city is not an answer for everyone. Not everyone can afford to live in a million-dollar apartment. What we are seeing is a massive enclavization in cities. Cities are now playing the game that suburbs originally played. The idea is that if you can control your own tax rolls and resources, then the hell with everyone else. The result is that some suburbs and some cities become rich while others suffer. The architectural manifestation of enclavization is the gated community, but make no mistake, the number one site for gated communities is not the suburb, it’s the city. How many new skyscrapers are being built without doormen? On the other hand, there have also been changes in the suburbs that are worth noting—especially since they tend not to be remarked upon in the press or by academics—I find them fascinating and in some ways even optimistic. When people think of the suburbs, they often think of the single-family house. But a great deal of construction that’s happening in suburbs today is entirely foreign to that. Compared to someone like William Levitt, today’s developers are much more canny, and much more interested in appealing to more distinct groups. Take Livingston, New Jersey. 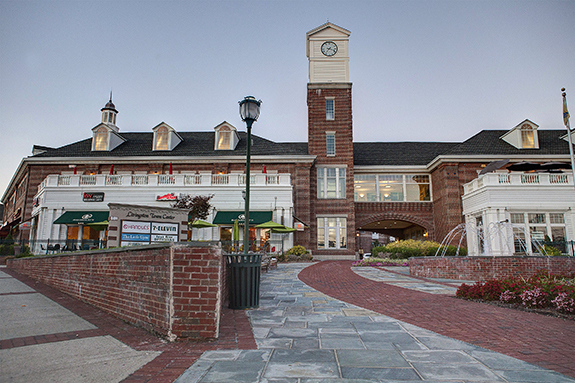 Right in the middle of the town, which has a population of around 30,000, there is something called Livingston Town Center. It’s all one unit, with townhouses built on top of stores. So this is a place where older people who don’t want to pay large taxes for property might live or maybe it might attract younger people who are accustomed to apartments. It may also be for people who want to be in some sort of center, but who work in, say, the pharmaceutical industry, which is located not far away. 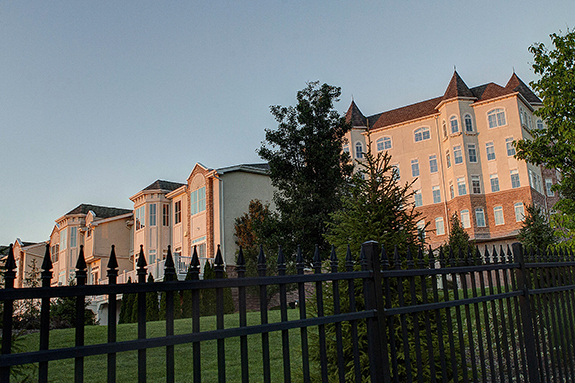 Or look at Vizcaya, a development in West Orange, New Jersey. If you looked at a big real estate map of West Orange, you would see all of these single-family houses going for about $600,000 each. The area surrounding Vizcaya, is thoroughly middle class, but in the middle of it, rising on this artificial hill, is this massive development, this luxury living experience in something that looks like a cliff dwelling with a bit of Cote d'Azur hotel mixed in. It may look alien to us, but it appeals to people who want to live in apartments in that location, even when they might cost a lot more than the neighboring houses. It has a twenty-four-hour concierge on the premises even as it literally has vinyl-sided houses right next to it. It obviously appeals to a very specific demographic. You leave there, and there really isn’t a lot around. I mean, the zoo is across the street, but other than that, it’s just these single-family houses and some office buildings for doctors nearby. Another example is out on Route 4 in Englewood, New Jersey where there is a community of lofts about a ten-minute drive from the George Washington Bridge. Brand new lofts out in the suburbs surrounding a shopping area. This isn’t what we’re supposed to expect; nevertheless it’s there. Returning to the city, if you were to have asked people to project to what New York City would look like in 2015 back in 1975, you would probably get a very different vision than what we’ve actually got. You would have gotten something like Escape from New York, and that would have been way off. And it’s also unlikely that people would have projected what 1975 looked like if you had asked them in 1955. So I think that’s one thing that we need to think about now—where are the next twenty years going in the city? I think we’re likely to see new forms of habitation that are tied to the one thing everybody doesn’t think has a future—the automobile. Elon Musk and Tesla (among others) are launching self-driving cars, but so are the major automobile manufacturers. Cadillac says their first self-driving car will be in 2017. The implications of this for cities are huge. If you can entirely reshape what a commute is, that would allow for a complete rethink of what communities are. For example, we’re still very much tied to a linear model of commuting—from specific areas to specific areas: from Westchester or Connecticut or Long Branch to Grand Central, from Long Island and New Jersey to Penn Station. What if that is short-circuited by a fleet of self-driving cars that could conceivably operate at very high speeds in special lanes dedicated to them? That could lead to an entirely different idea of commuting. Historically, forty-five minutes is the upper limit of one-way commute time that people will put up with. Some people will put up with more—especially in poorer economic brackets—but most middle class people have forty-five minutes as their upper limit. What happens if that time can be productive? What happens if you can move much faster and farther during those forty-five minutes? We might see a very big shift in terms of what it means to live in the city versus living in the suburbs. It may be that calling Hudson, New York, “the New Brooklyn” will have an entirely other meaning soon. And auto companies aren’t likely to stick with the current model of ownership. You could get self-driving cars that might be based on a variation on the Uber model. Instead of owning a car, you might call one. Let’s say I come here in a self-driving Audi, it drops me off, drives away, and goes to pick up someone else. It’ll come and get me later according to the schedule I’ve given it. I might pay higher to use it at peak time, or less if I’m willing to share it with three other people. This alone could transform the relationship between the suburbs and the city. But I don’t see enclavization disappearing. On the contrary, even though the densification of certain suburbs with large apartment buildings and lofts is taking place, these largely replicate the dominant model of enclavization, with the poor pushed more and more to the peripheries, fragmented into smaller areas with no real voice or power. This new model of commuting that I am describing is little different. Right now, if you commute in from a place like West Orange to Manhattan on the train, you still have to go to the train station, and then you’re still passing through, and stopping in, places like East Orange and Newark, both of which have very high levels of poverty. But what if in the future people are picked up by self-driving cars in places like Vizcaya and then travel through entire regions where all they see are trees—behind which poverty has been walled off—before they get to their destinations in places like Manhattan? This is not a particularly utopian scenario. Davis, Mike. City of Quartz: Excavating the Future in Los Angeles. London: Verso, 1990. In 2011, a Los Angeles Times blog post described the books as an “attack on the rampant privatization and gated-community urbanism of Southern Calfornia” that, though flawed in some ways, was “ the most significant book on Los Angeles urbanism to appear since Reyner Banham's Los Angeles: The Architecture of Four Ecologies was published in 1971.” See Hawthorne, Christopher. “Reading L.A.: Mike Davis, ‘City of Quartz’ and Southern California's ‘spatial apartheid’” Los Angeles Times. 30 June 2011.